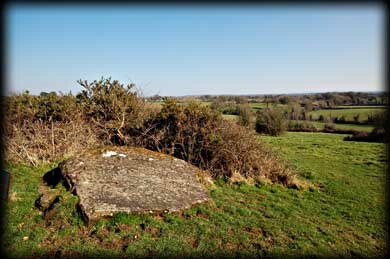 The surface of the large glacial erratic boulder at Clonfinlough is completely covered with rock carvings including some cup marks. These have always been thought of as bronze age markings. The recent discovery of a bronze age settlement in the valley below the boulder would further add to the weight of this theory. But there are many crosses also inscribed on the stone and even the shape of a foot. Recent study and the similarities between the Clonfinlough stone and carvings on the Iberian peninsula suggest they may be from the medieval period. 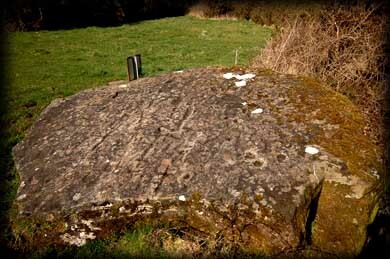 Because of the close proximity of the boulder to an old pilgrimage route to Clonmacnoise it is also suggested the inscribings may be related to pilgrimage activity. Situated: 3 kms from Clonmacnoise, well sign-posted. Discovery Map 47: N 041 295. Last visit March 2011.